As the recent wave of teachers strikes demonstrated, to win they had to refuse to work in large numbers until their demands were met. Immigrants must now follow their lead. The wave of teacher strikes across the United States this year is a reminder of what workers can accomplish if they use their labor as leverage when making demands. Following strikes that ranged from six days to over two weeks, teachers won wage increases in four states. Some also won more funding for their schools — a clear benefit not just to teachers, but students and parents as well. Such victories should serve as inspiration to all workers. But for immigrants — the backbone of this country’s economy — it should be a rallying force. Without immigrant labor, the economy would collapse. Yet most people do not recognize the role immigrants play as workers. As an immigrant myself, I see this all the time. We are not even acknowledged as members of this society. This becomes even more clear when people talk about undocumented immigrants, a sector of workers that gets pushed into the shadows. The media vilify undocumented immigrants, referring to them as “aliens,” “illegals” and “thugs and drug lords.” Undocumented immigrants are also targeted by law enforcement and by abusive employers. The criminal justice system is set up to target undocumented immigrants. At the local level, many states have collaboration agreements between police and Immigration and Customs Enforcement, or ICE. Local policies like that result in the detention and deportation of undocumented immigrants. ICE also targets communities by coming into our neighborhoods and picking up people in the streets, outside the courthouses, inside schools and hospitals, and even at our workplaces. How much longer are we willing to suffer these injustices? Many immigrants assume that if we simply trust the political process and the politicians who claim to be our friends, we will find a solution. The truth is that we have trusted the system for decades. We’ve trusted politicians when they have promised immigration reform and pledged to pass some sort of legislation in their first 100 days in office. But they have failed us every single time. They don’t seem to care that our friends, families and neighbors are getting picked up by immigration officials right in our streets or that many of us end up in detention for simply driving without a license. And what have they done about the children being separated from their parents simply because they don’t have a social security number? We have seen how both Republicans and Democrats have made deals with for-profit detention centers to keep us locked up. Neither of these parties have ever intervened when ICE steps into our communities and raids our workplaces. We have heard countless empty promises from different political parties, which — at the end of the day — only care about their political seats. If anything, we have been constantly told to wait. For decades, we have been told that we cannot win. Time and time again people have tried to tell us how we should behave, how we should fight and what we should be fighting for. Every time we raise our voice, we are told that we have to wait. The economy of this country functions because of us. We work in multiple sectors, from service to transportation to farming. And while that work doesn’t define us, we are a powerful labor force that needs to be reckoned with. We will use this power to fight back because we are tired of waiting. We know that if we decide to not go to work, entire services and companies will shut down. At the same time, going on strike is scary prospect for many of us. In those moments of fear we must remember that we are capable of taking risks. We’ve mobilized in big numbers before, and we’ve gone on strike before. In 2006, millions of us flooded the streets of Los Angeles, Chicago, New York and other major cities across the country because an anti-immigrant bill was about to become law. Known as the Sensenbrenner bill, this legislation would have criminalized all of the undocumented people in this country, as well as any person who provided aid or services to them. People didn’t know what to do. We couldn’t rely on the same political process that was just about to criminalize us all. After all, we couldn’t vote. What we could do, however, was mobilize. And we did! 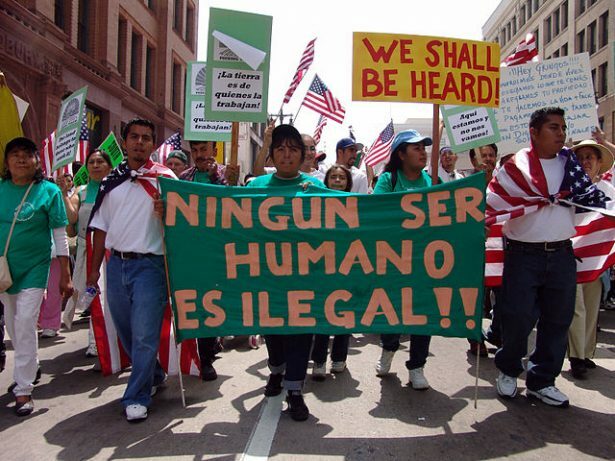 We made our banners and posters that said “Ningún Ser Humano es Ilegal” and “Inmigrantes Unidos,” and we went on strike on May 1, 2006 — a day that became known as A Day Without Immigrants. Millions of us took the streets and won, forcing the failure of the Sensenbrenner bill. We did it again last year. Following the organizing efforts of Movimiento Cosecha, a nonviolent movement fighting for the permanent protection and dignity of all 11 million undocumented immigrants in the United States, immigrant workers once again went on strike on May 1. This time it was to highlight the immigrant labor that sustains this country and the value we bring — an important message to raise amidst an anti-immigrant climate. We knew that our community was under attack. We also knew that we could no longer remain in the shadows or live in fear. We showed our presence that May 1. Businesses like bakeries, markets, clothing stores and restaurants closed down in solidarity, and people who have never been part of a march or rally organized themselves and took to the streets. However, one day is not enough. In order to win permanent protection dignity and respect we must not only go on strike, but we need to be able to sustain the strike. As the teachers demonstrated, to win they had to hold their ground and refuse to go to work until their demands were met. That is what the immigrant community needs to do when we go on strike, and we have to do it in large numbers across the country — just like the teachers. Movimiento Cosecha is working towards organizing such a strike. It will be holding a National Assembly this September and will be inviting the immigrant community to make this vision a reality. We can create change through direct action and economic non-cooperation, as the teachers have shown. Now it is time for us to follow their lead. Un artículo bellísimo. La acción noviolenta y su filosofía se basa en la capacidad para no dejarse deshumanizar. Ser humanos con los otros. Reconocer el esfuerzo por trabajar en otro país, aprender otra lengua, hacer que sus hijos amen la nueva patria. Un gobierno sensible a la inmigración, genera una policía más humana, unos funcionarios más empáticos, una estructuras institucionales con menos violencia estructural. Noviolencia es la tarea de humanizar a la humanidad. Enhorabuena Catalina.